“Baked today, sold today” is just one of the mottos Stephen recounts to me as we both tuck into a World Scotch Pie Champion winning pie on a sunny Thursday afternoon in British Pie Week 2016. And it’s the dedication of Stephen, his wife Rona and his wonderful 83-strong team of bakers, shop assistants and other employees that is clearly evident as we chat. 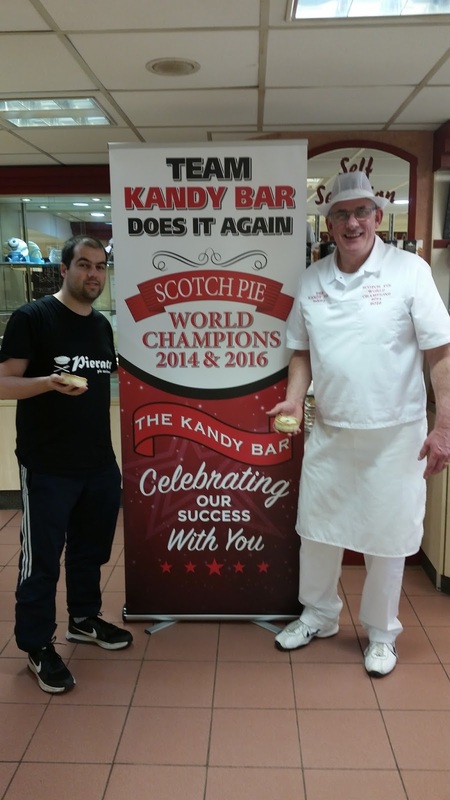 Stephen has been the owner of The Kandy Bar Bakery since 1991 and despite it being just the past few years that they have really shone in the limelight with their 3 big wins at the Scotch Pie Club Awards (overall winners in 2014 and 2016, plus best football pie in 2015), he is adamant the team of workers have been doing a great job for years. And without wanting to exaggerate, I think it’s safe to say the double win at the Scotch Pie Club Awards has firmly put Saltcoats on the map! Traditionally a small coastal town 40 minutes away from Glasgow popular with tourists, the pie wins have led to a whole host of visitors to the town, particularly wanting to visit and try their winning scotch pie. Pies continue to be a large part of the community there. 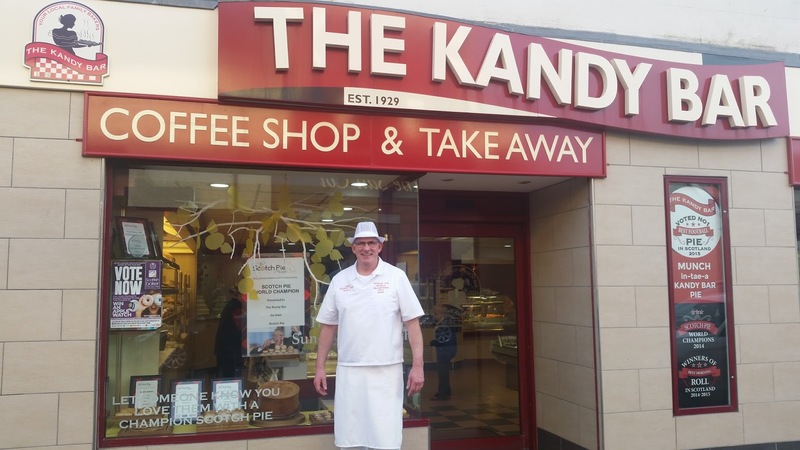 The pies available at Kandy Bar Bakery include - alongside the Award winning Scotch pie - the Scotch Onion pie (you guessed it - a scotch pie featuring more onion than the standard version), a haggis pie, macaroni pie and apple pie. We focused on the fully encased pies on offer, rating the Scotch pie, Scotch Onion Pie and Apple pies all as Pierate Highly Recommended (above 6 out of 7), which is a great achievement and sign of true quality across their range. Do check out the review for more details of why they were so good! On my visit I was delighted to be given a short tour of the bakery facilities, before the all-important taste test! The shells of the scotch pies are something Stephen is particularly proud of, informing me that they are a bit softer than the average scotch pie available which makes them ideal for re-heating at home to whatever crispiness the customer wants. As we all know, the customer is always right! And the Kandy Bar Bakery are able to provide a pie that is firm but soft enough pre-heating to cater for a range of pie crispiness levels, where as other naturally firmer scotch pies cannot provide a softer, less crispy finish to the pastry like the Kandy Bar ones. This is to cater specifically for the Kandy Bar customers, who prefer to take their pie home to cook and eat it, and due to a secret recipe Stephen wasn’t going to share with me, of course, but he said it is the same recipe his father used in the 1960s, which had been passed down to him. In fact, the history of pies in Stephen’s family goes back much further than the 1960s, with his grandfather having set up a bakery in 1929, before his father decided to set up a sweet shop but one selling scotch pies! 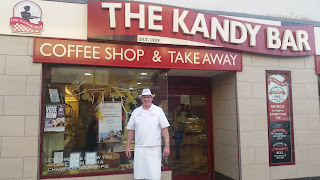 The name Kandy Bar – which does admittedly seem a slightly odd name for a bakery! – comes from the sweet shop Stephen’s father used to run and the name stuck despite Stephen reverting back to a more typical bakery offering of bread, patisseries and – most importantly – pies! And boy does Team Kandy Bar make pies! 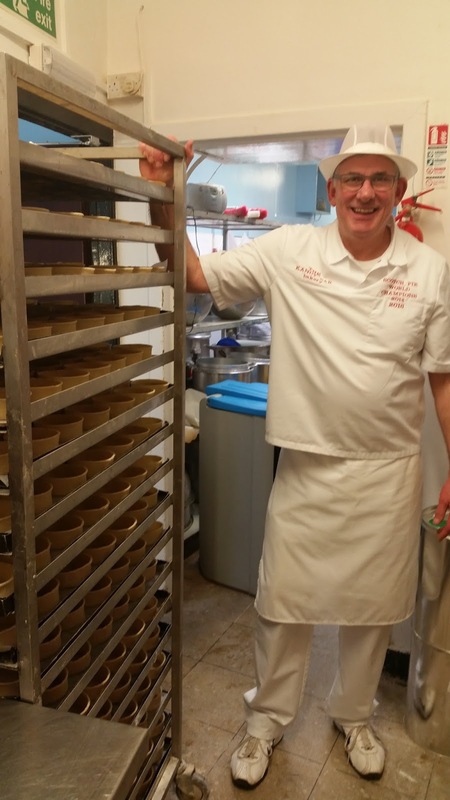 Around 1,200 a day are made early in the week, with a surge to around 1,600 on a Saturday, though shortly after winning the Scotch Pie World Champion title again in 2016 there was a natural surge of customers from far afield! This is on top of the rugby clubs (Stephen is a keen rugby fan and past player), football clubs, schools and other local facilities Kandy Bar Bakery supplies to, and Stephen even recalled past deliveries to local Church Sunday School classes when he was younger! It was certainly a long way to go but was great to have visited and met Stephen, his wife Rona and the fabulous “Team Kandy Bar”. 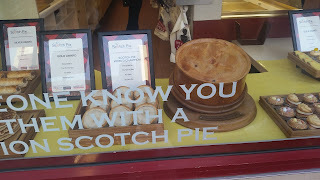 I certainly hope to visit again sometime and wish the team all the best in their attempt later this year at the World Scotch Pie Champion hat-trick! Click for all Kandy Bar Bakery Pie Reviews.